Discover the historic heritage village of Hahndorf and the Adelaide Hills on this trail hopping wine tour showcasing the best gourmet food and wine in the region. The Hop On Hop Off tour gives you the freedom to explore the region on regular scheduled buses without having to worry about driving. Enjoy traditional German cuisine at pubs and cafes in Hahndorf, fine dining at vineyards or visit the cheesemongers and chocolate factory at Woodside. Plan your own day out according to the groups tastes and interests. With over 10 locations to choose from it is not possible to visit them all in one day but you can visit up to 4 locations with careful planning. 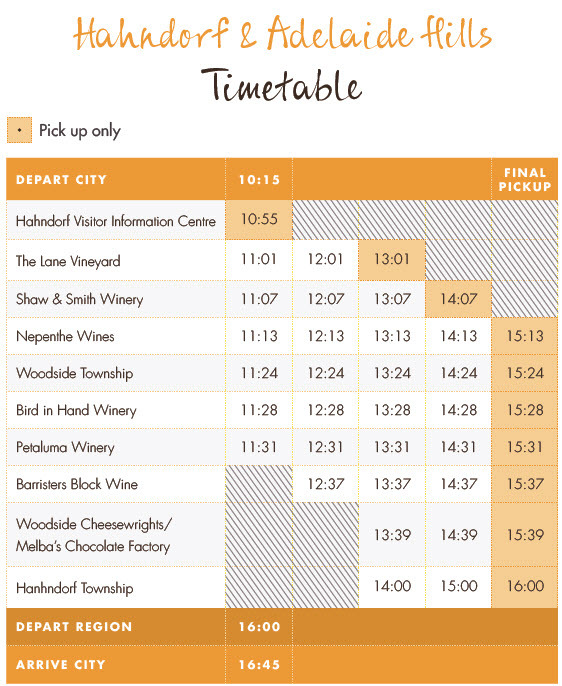 The Hop On Hop Off includes transfers from Adelaide city and transports guests throughout the region all day on regular scheduled buses to a variety of wineries. Book online to secure your spot on this wine tour today!